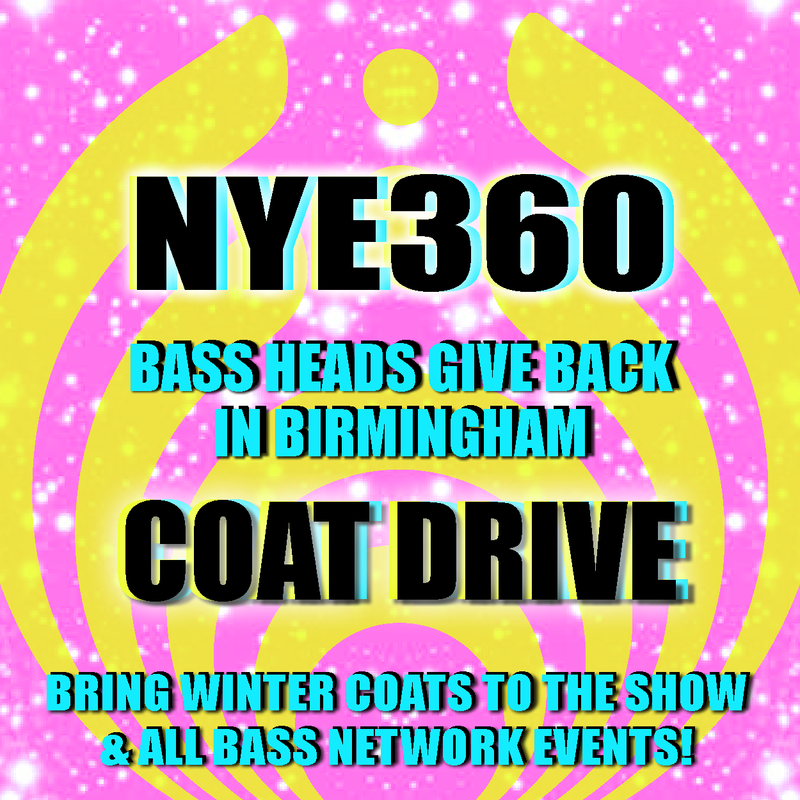 Let’s launch into 2017 the same way we did 2016: together at the BJCC, bringing the Wildstyle, and giving back to the Birmingham community that has welcomed us with open arms! 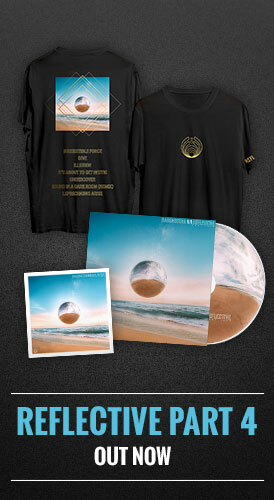 We are bringing back The Haven once again! 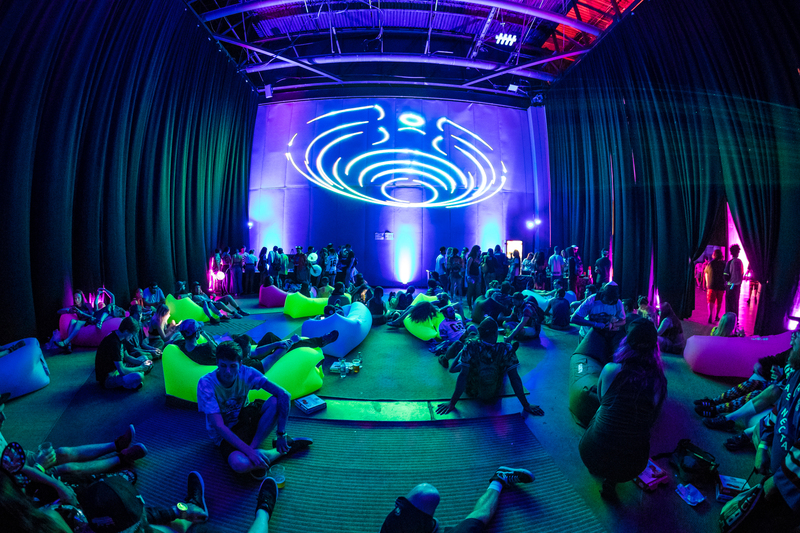 This will be a main feature at our special events moving forward – it is your sanctuary inside the venue where you can get away, chill out, and take a break from the madness. This is also Ambassador HQ, so Ambassadors will be there to greet you and make sure you a comfortable and taken care of. They will be handing out water, juice, tea, snacks, ear plugs, and more! See the map above for The Haven’s location or ask an Ambassador when you arrive at the venue. 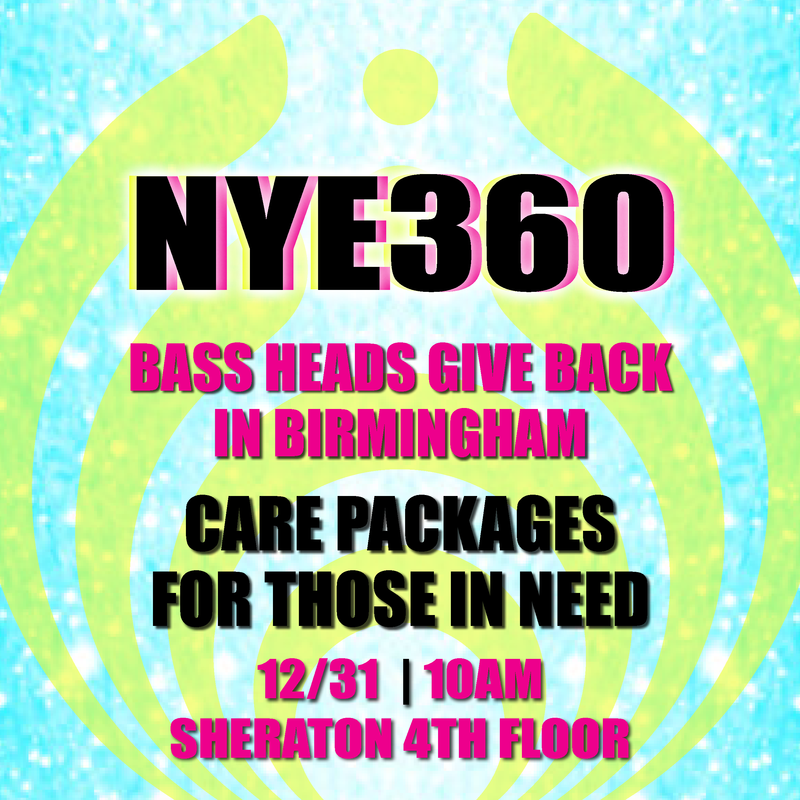 Ambassadors + Bass Heads will be getting together the morning of New Year’s Eve (12/31) to put together care packages for those in need around downtown Birmingham. If you would like to join, meet at the Sheraton Birmingham at 10 AM to put the care packages together. The Begonia Room on the 4th Floor has been booked so yall can meet up, work together, and GIVE BACK! Items to bring, more info, and RSVP HERE! 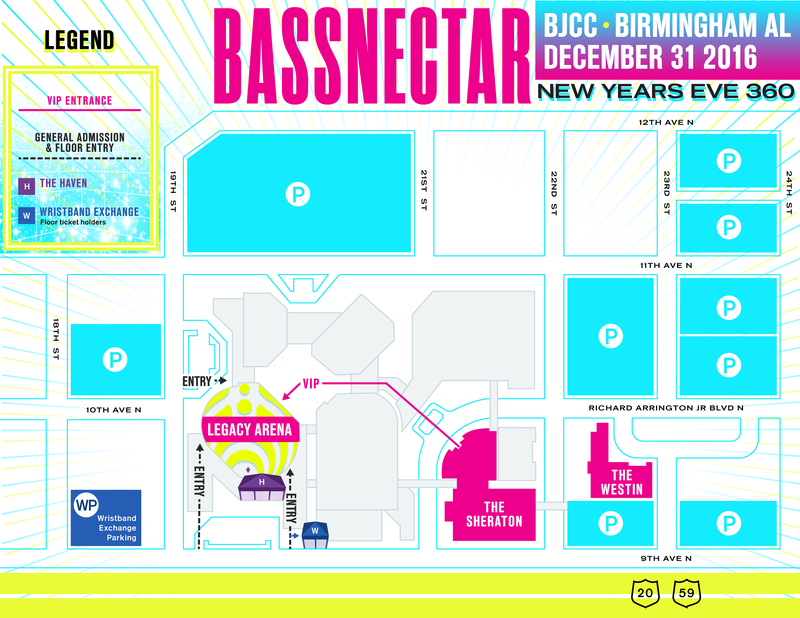 There will be a Bass Head Meetup on Friday 12/30 at a local pizza place in Birmingham! Come out and make some new friends for years to come – more info & RSVP here! It is going to be packed and get hot in this room, let us repeat: IT IS GOING TO GET HOT IN THIS ROOM! Please make sure you are drinking lots of water all weekend. Ambassadors will be distributing water around the arena. Fun fact: water gives you energy! So take advantage of its many healing qualities and hydrate thyself and others. Es muy importante!!! 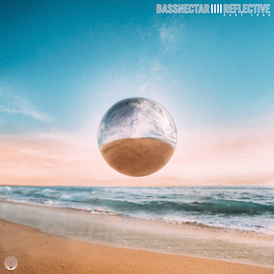 The Bassnectar Crew works to bring the most state-of-art, engulfing sound experience to your ears. But like any of our events, we always promote wearing ear plugs. Not only does the show sound just as good, but ear plugs can protect your hearing, which is something you do not want to ever lose (TRUST US) – Ambassadors will have them for you, so reach out to them and ask for some for yourself + friends. You won’t regret it. We hope each of you make safe decisions all weekend long. The well-being of all people attending our events is our TOP PRIORITY. Of course we want everyone to have the most amazing time possible, but it’s more important to start the new year off fresh, clear-minded, and ready to conquer all of our goals and dreams in 2017. There will be plenty of stimulation from all of the activities going on and all of the water you’ll be drinking! So please be mindful of your body and protect your brain. Please keep an eye out for those around you and take care of each other: You Know We Love It!